After spending the ’50s writing for Your Show of Shows and The Phil Silvers Show, Neil Simon stayed in New York City instead of heading to Hollywood to keep working on TV. He wanted to conquer Broadway and he did. His plays including The Odd Couple, Barefoot In the Park, The Sunshine Boy and 46 other productions made Simon one of been one of the biggest names on the Great White Way. During the mid-80s Simon embarked on the Eugene Triology that was a semi-autobiographical account of his youth from a kid in New York City to his time in the army and his early days of writing comedy. Brighton Beach Memoirs starts the Eugene’s saga with his life at home while he’s still in high school. Eugene Morris Jerome (Weekend at Bernie‘s Jonathan Silverman) dreams of being a New York Yankee. Except he fears there’s been no fearsome Yankee batter that went by Eugene. So he’s trying to get better at writing. Luckily he has plenty of material under his family’s roof. His mother (Meet the Parents‘ Blythe Danner) knows how to dish out guilt on her family. His father (The Big Bus‘ Bob Dishy) has to work a lot to support his family. His brother Stanley (Brian Drillinger) is a bit of a role model. The space gets weird when Eugene’s mom’s widowed sister ( Designing Women) Judith Ivey and her two daughters. Eugene keeps having dirty thoughts about his cousin Nora (The Odd Couple II‘s Lisa Waltz). She has the desire to be part of a Broadway musical, but everyone wants her to finish school beforehand. Eugene just dreams of “accidentally” walking in on her while she’s in the bath like his brother once did. Life in the house isn’t gets intense when the father has a health scare and money gets tight. Things get tighter when the brother has issues at work and he encounters Jason Alexander (Seinfeld) in a pool hall. Jerome comes to an understanding that his childhood is coming to an abrupt ending in Brighton Beach. Director Gene Sacks had a serious history with Simon from working with him on his Broadway plays and directing film adaptations of Barefoot In the Park, The Odd Couple and The Last of the Red Hot Lovers. For their fourth big screen collaboration Sacks gets the play to open up so we’re seeing a movie instead of watching a stage play on a few sets. The core of the action does take place around the house, but the space is big enough with plenty of rooms. Plus Sacks takes the action onto the streets dressed up to be 1937. He appears to stick tight to Simon’s dialogue from the play so you’re getting the whole experience and not just a summary. He even lets Eugene talk to the audience to preserve the monologues and aside moments. Sacks gives us a play-movie hybrid. 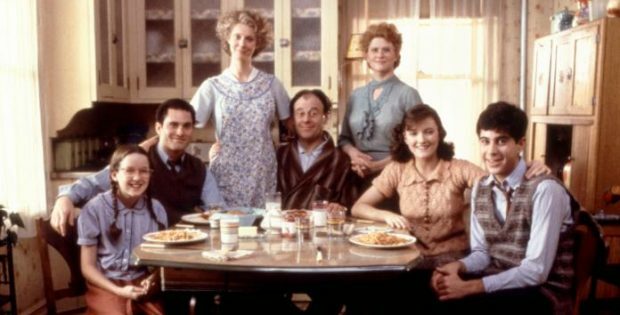 Brighton Beach Memoirs is the perfect answer to how Neil Simon realized he had natural talent for writing comedy. You have to be a bit funny to cope with a plate of spaghetti covered in ketchup. The video is 1.85:1 anamorphic. The transfer brings out the finer details of the production design that made the movie seem like a slice of pre-World War II New York City. The audio is DTS-HD Mono. The levels are find. The mono helps make the film seem throwback to the era before stereo or surround sound. The movie is subtitled. Theatrical Trailer (1:26) deals with Eugene’s fascination with his cousin and the family drama. Shout! Factory presents Neil Simon’s Brighton Beach Memoirs. Directed by Gene Saks. Screenplay by: Neil Simon. Starring: Blythe Danner, Bob Dishy, Judith Ivey, Jonathan Silverman and Jason Alexander. Rated: PG-13. Running Time: 109 minutes. Released: March 26, 2019.